Try H&M for the scarf... I swear I've seen something very similar there. That's just gorgeous! Sparkly skulls, I love it! Stamping always looks so nice, but I just can't seem to get it right... I'm afraid I'll have to accept I'm nailart-challenged and stick to glitters to spice up a mani. This was awesome! I like your inspiration and it feels like I've seen cheaper copies of it.. but I'm not that in to fashion either so I can't tell which stores I've seen it in or if you even got those stores where you live. Love that! 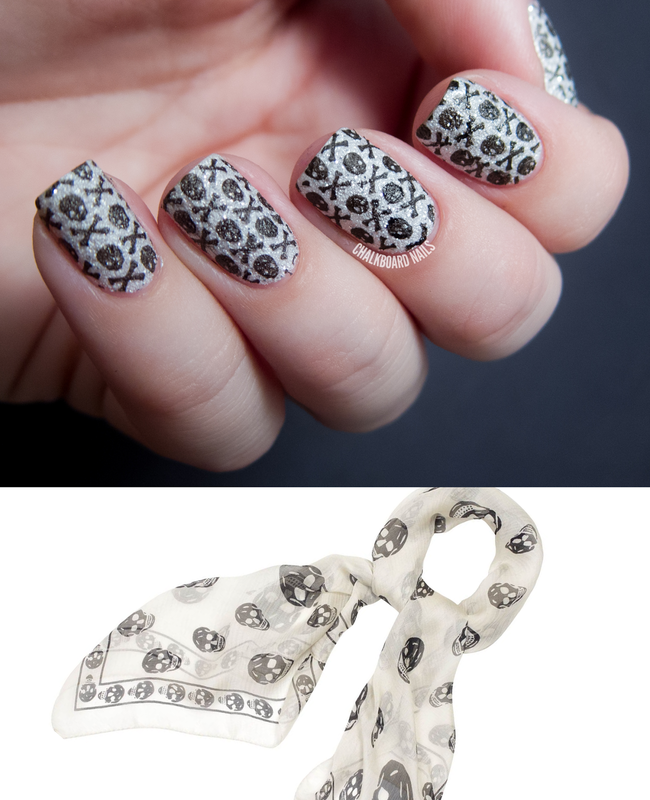 Those skulls look great on top of the textured polish! Stamping over the textured polish really gives this depth! 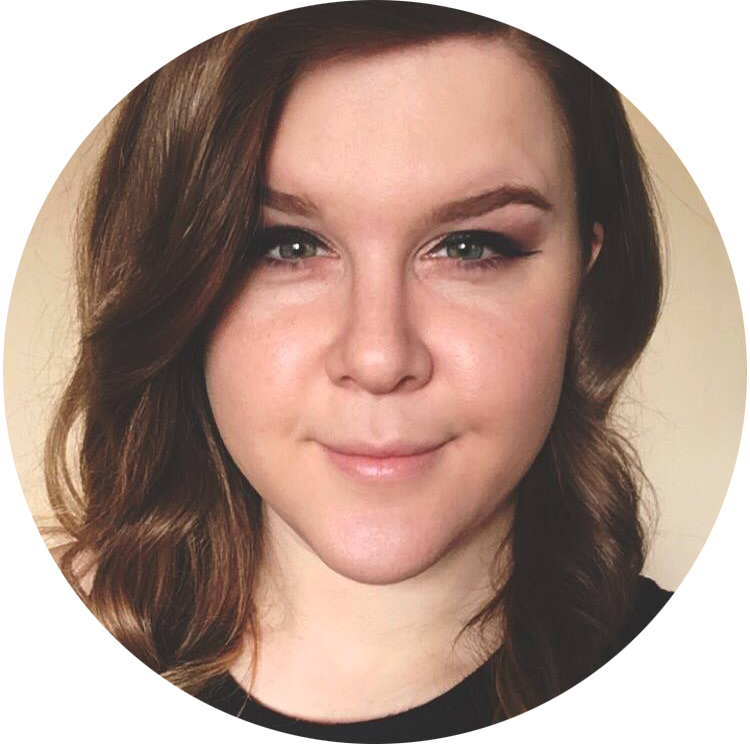 Great work, as always, Sarah! I love the stamp over texture! Marta at ChitChatNails did it and said even the wear time on the stamp is good--she had some on for days and it didn't rub off! I was impressed. I love skulls. This is one of my favourite manis you've done. Also, good news.. 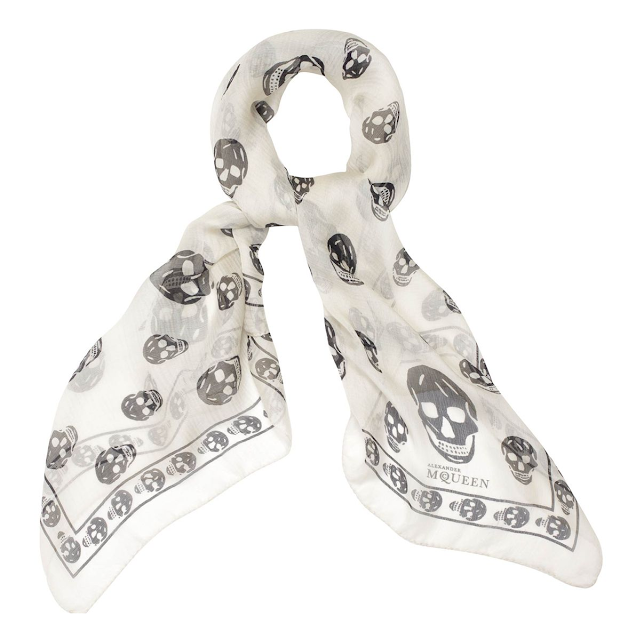 I saw a skull scarf at Wal-Mart recently, and I think Target too. They are definitely out there! Very cool! I have a very similar scarf from DSW for MUCH cheaper! I bought it last year, but I'm sure stores still have them. Great mani, I love it! the texture! what a great idea! i LOVE McQueen and i love your nails. brilliant going textured! Knock-off on ebay? You did an awesome job! I only recognized this scarf because I happened to see it in a magazine this week. Definitely feel you about not being up-to-date on fashion. This works soo well with the textured polish!